description = "my foo task"
The problem with this approach is that, in my case, I had multiple large Kotlin scripts I wanted to make executable this way. If I had put all of them into tasks, the script would have been too bloated and hard to maintain. Note that in my case, these tasks would not contribute to the build logic directly but rather provide business-relevant tasks, which I wanted to make executable via Gradle. │   └── src //custom plugins, taks etc. As you can see here, the buildSrc has its own build.gradle, in which we define dependencies and plugins for buildSrc itself. As mentioned, the compiled code will be available for the surrounding build so that you can for instance define custom tasks in the buildSrc and use them in the main build.gradle. Let’s say we have two bigger tasks we want to make available as Gradle tasks, which we call task1 and task2. Both tasks are good fits to be implemented with Kotlin. As mentioned, we add the dependencies we want to use within the buildSrc. 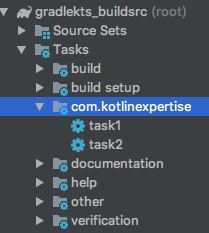 Another thing to note is that the org.gradle.kotlin.kotlin-dsl plugin is applied to this build in order to set up the Kotlin compiler features and dependencies to match the ones shipped with Gradle. We used the nicer alias kotlin-dsl in this example. You may want to read another article of mine about the Gradle Kotlin DSL to get more information about the topic. Enjoy.